'Massive Flooding' In Colorado's Boulder County : The Two-Way More rain is on the way and a flash flood warning remains in effect. At least three deaths are being blamed on the high waters and a rural dam has reportedly collapsed. The University of Colorado's Boulder campus is closed. 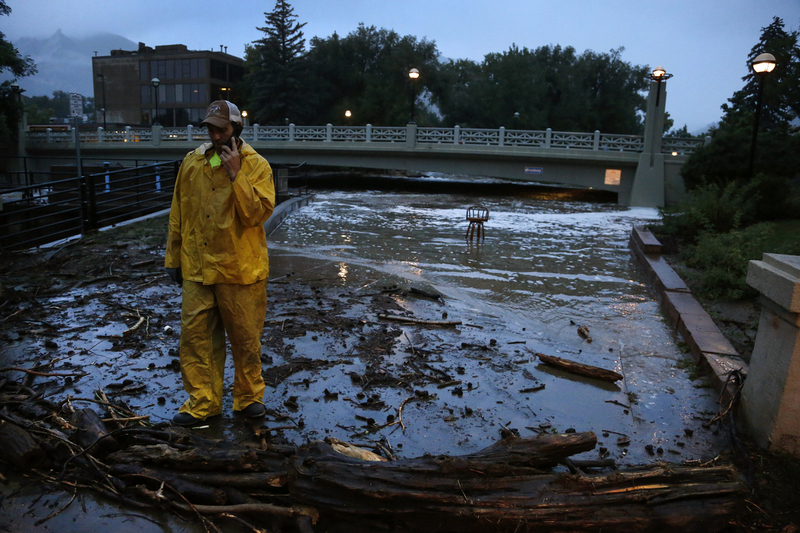 A city worker talks on his phone while surveying high water levels on Boulder Creek following overnight flash flooding in downtown Boulder, Colo. today. 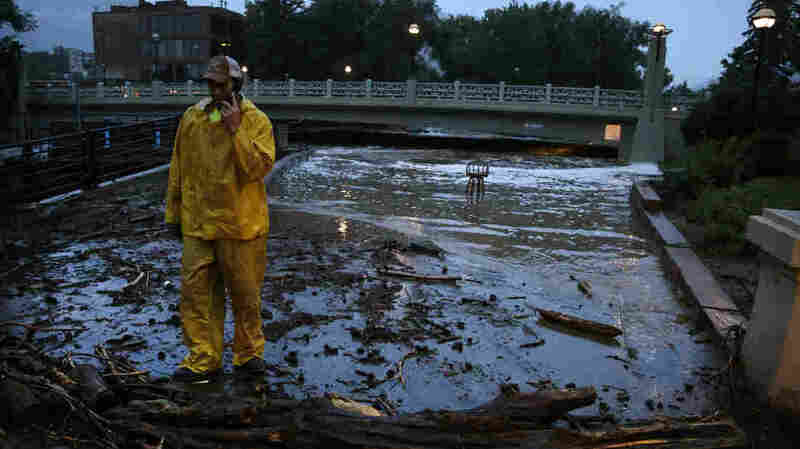 Flash flooding in Colorado has left two people dead and the widespread high waters are keeping search and rescue teams from reaching stranded residents and motorists in Boulder and nearby mountain communities. A huge overnight downpour that brought 4 to 7 inches of rain to the area around Boulder, Colo., has already produced "massive flooding" in the streets there, The Denver Post writes. Boulder County, Colo., has been hit hard, but flash flood warnings for Thursday extend down into New Mexico. -- At least one rural dam has given way. -- More rain is on the way Thursday. According to the National Weather Service, a "flash flood warning remains in effect until 7:15 a.m. MDT for central Boulder County." The Boulder Daily Camera says that "meteorologists are calling the downpour that intensified Wednesday night — forcing evacuations in the foothills and canyons, collapsing structures, flooding city streets and killing at least one — somewhere between a 10-year and 25-year flood." The flooding has forced the University of Colorado Boulder to close and evacuate some residents to higher-lying parts of the campus. Census Bureau data show there are about 305,000 people in Boulder County — 102,000 in Boulder city alone.